YouTube revisits live video streaming for masses with a live-stream test today and tomorrow. Starting at 8 a.m. Pacific Time, Live on YouTube will stream live entertainment programming from four online media partners. No stranger to live video, YouTube has experimented with live streaming over the years on a case-by-case basis. It first tested the live video streaming waters back in 2008 with YouTube Live — “part concert, part variety show, and part party” — and more recently, live broadcast Google’s press conference announcing Google Instant. President Obama answered questions live earlier this year on YouTube, and rock band U2 broadcast a concert last year. Part of the trial of the service includes a Live Comments module, where you can chat with other viewers and live broadcasters as you watch the show. What can you watch during this test? Next New Networks, a producer of series programming online, will offer a variety of programs, including satire from its Barely Political channel. Young Hollywood will be presenting lifestyle programming and live celebrity interviews, including one with skateboarder Tony Hawk. 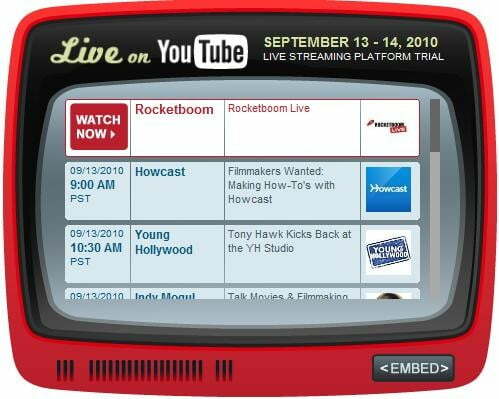 Rocketboom will offer news and entertainment. The final fourth partner is Howcast, which will offer instructional videos. The live broadcasts are available from these partner’s channel pages. A full schedule is available on the YouTube blog. Live on YouTube will be available on YouTube.com and also via an embedded Web app that can be dropped on any site or blog.